Subnotebook, Netbook or Something in Between? 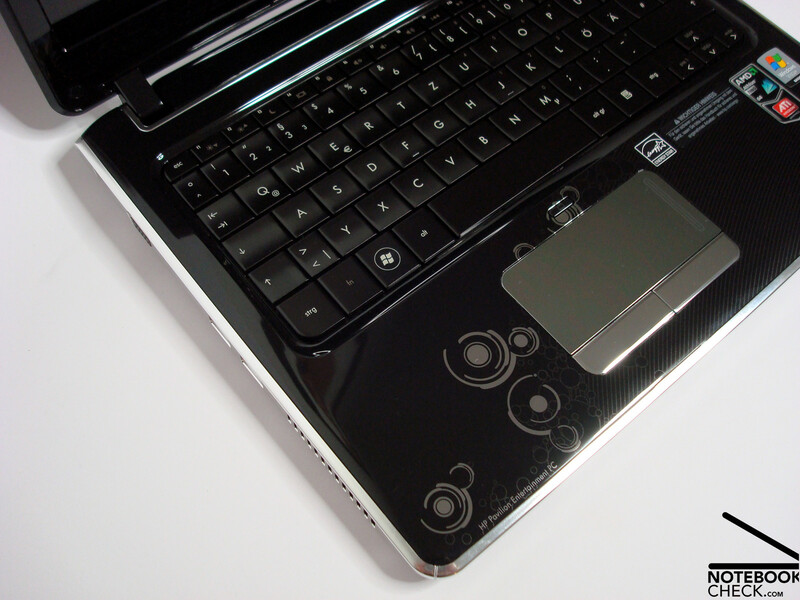 Many have a hard time classifying the HP Pavilion dv2. 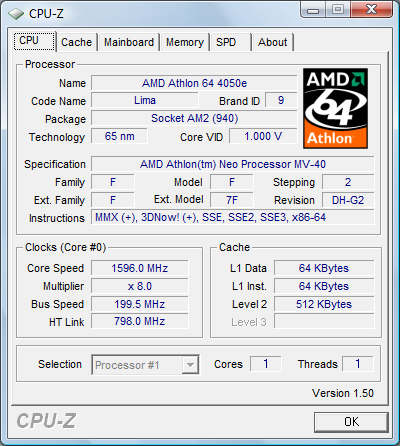 The reason is primarily the employed AMD Athlon Neo MV-40 processor, which is seen from many as AMD's answer to the success of Intel's Atom range. Therefore, it seems obvious to compare it with mini-notebooks. AMD positions its Neo, which is based on the AMD Yukon range, in the section of small and light subnotebooks. 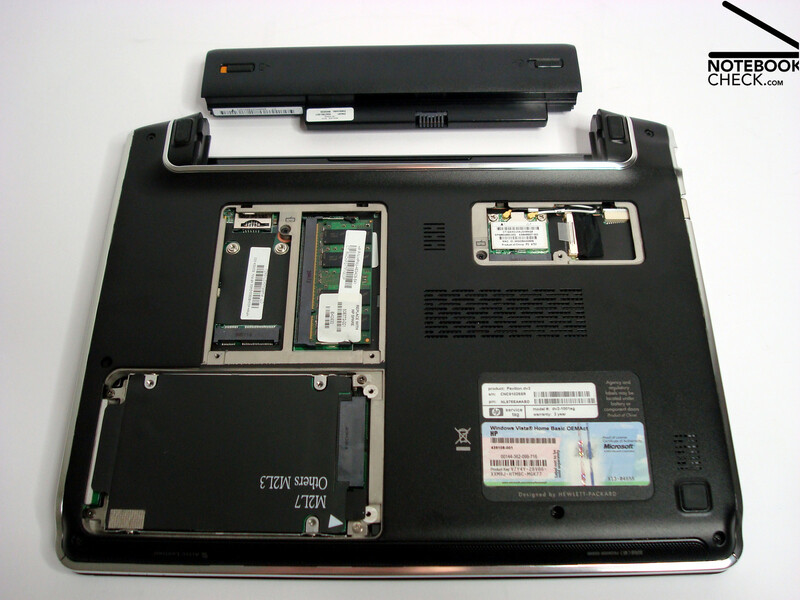 Higher margins and larger triumphs should basically be easier achieved than it is presently the case on the highly competitive netbook market. 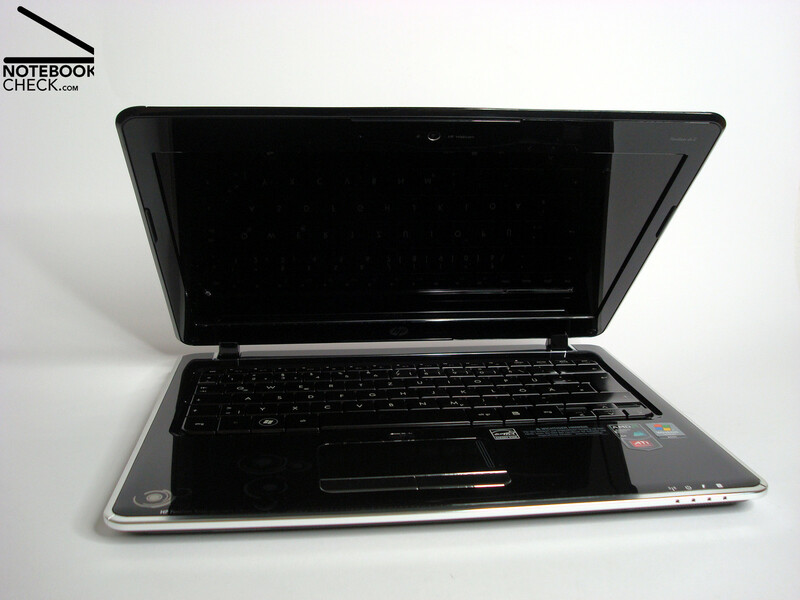 The HP Pavilion dv2 is currently listed on Hewlett-Packard's homepage in 4 different configurations which are all equipped with the 1.6 GHz clock-rated Athlon Neo MV-40 one core CPU. It's supposed to be particularly light, thin and economical and attract mainly the target group of mobile home users. 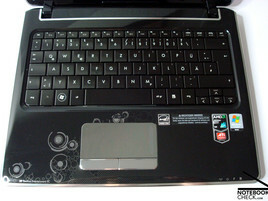 Significant distinguishing features are found in case color, the built in hard disk, the graphic chip, the installed operating system, the battery capacity and the external DVD drive. The prices start at 599.00 Euros SRP and go up to 799,00 Euros. We tested the low-priced basic version with ATI's integrated Radeon Xpress X1270 graphic, a 160 GB hard disk, Vista Home Basic and without the external DVD burner. The street price lies currently slightly under the manufacturer's SRP and therefore notably over comparable competitors like Samsungs NC20, Dell's Mini 12 or born-and-bred subnotebooks such as Acer's Travelmate 6292 or FSC's Esprimo U9200. 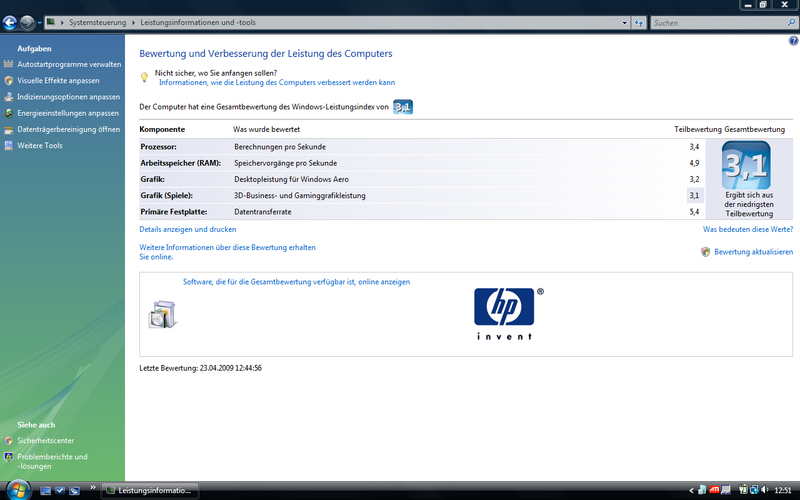 So what does the HP Pavilion dv2 have? We can't deny to have had a small "wow-effect" at unpacking. The whole façade of the 12 incher appeared very elegant, almost noble. Except for the plastic bottom, the whole case - including the display frame - is covered in a high-gloss black varnish. 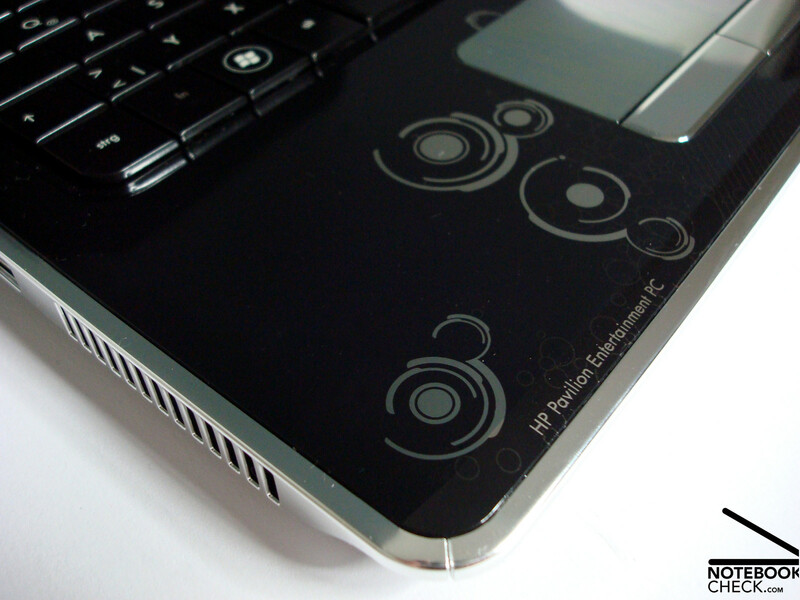 HP alternately also offers a white variant in the premium configuration lines. Silver-highlighted design elements, side components and an ornate frame give our test model a noble contrast and sets contrasting accents. 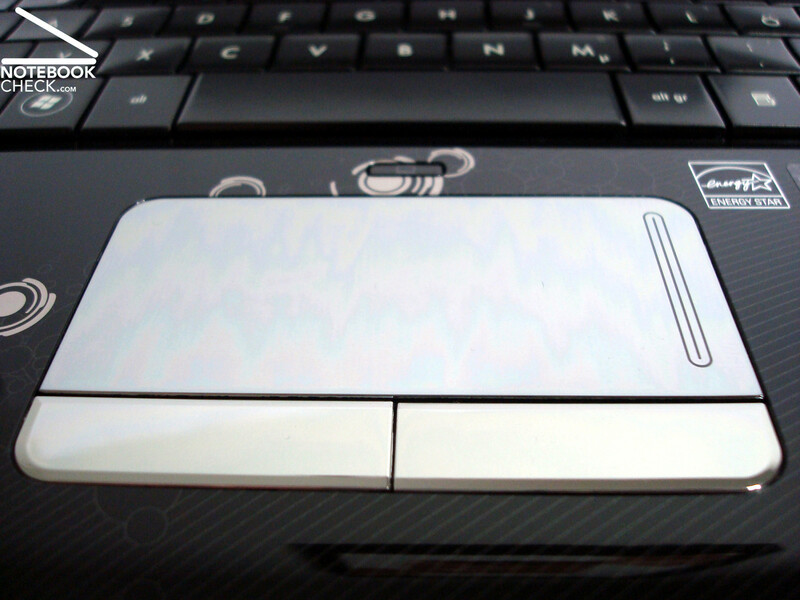 The touchpad presents itself as especially striking - and even useable as a mirror. As nice as the glossy surface is at unpacking, it can't keep its inconveniences caused at daily use secret for long. Fingerprints, dust and reflections, which could turn out negative for working in the area of the display frame, become quickly obvious and lets the included cleaning cloth be promoted to a best friend. 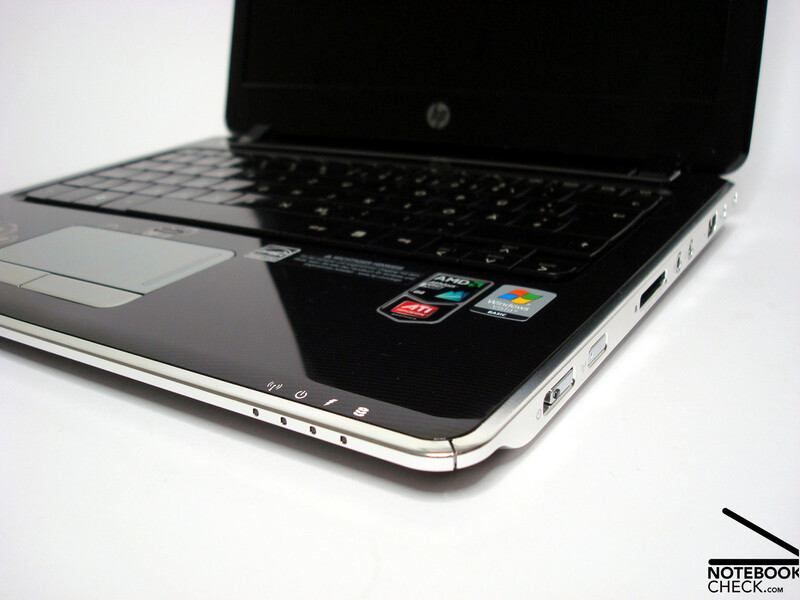 HP hides a very sturdy and high-qualitatively manufactured case under the cover. Gaps, truing and workmanship are almost without flaws and indicate a good manufacturing quality on the whole. We can't really say if this is a single case or due to production, but we had to establish a slight case-buckling, which lead to the left base not resting on the surface and causing the device to tilt. The reason might be the louver in this area and the higher case temperature caused by this, which leads to a material-buckling in this part of the case. 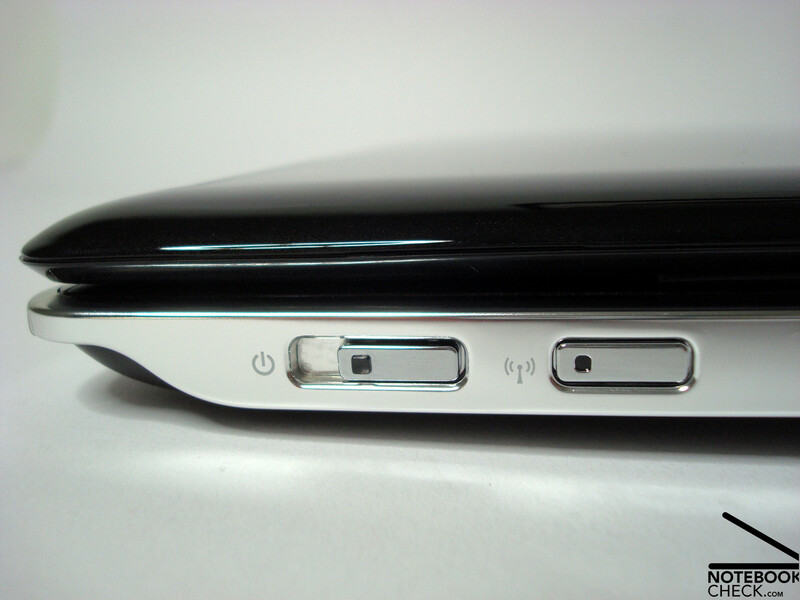 We also found a not quite concisely fitting, protruding component on the device's back side, in the area of the left display hinge, which isn't in the usual field of view but represents an unnecessary flaw in the design-orientated product, anyhow. 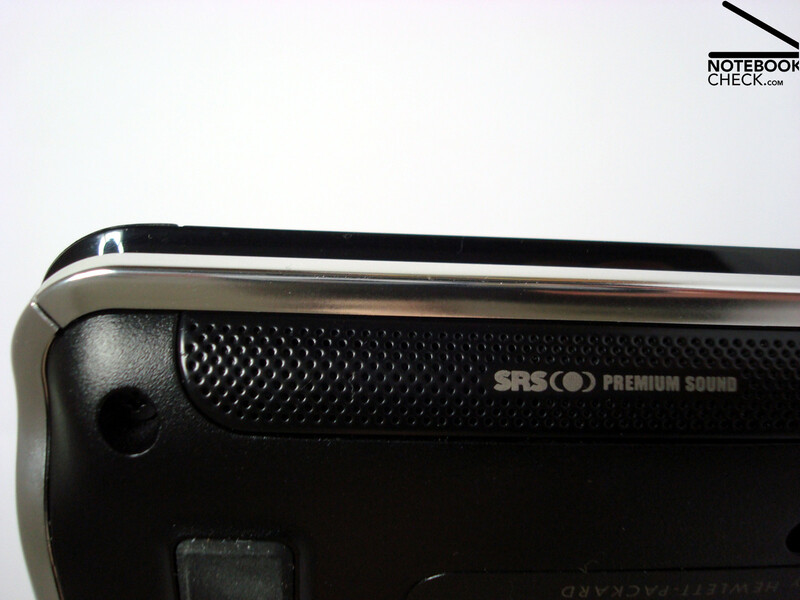 In return, the notebook reaches almost a full score in the category of pressure resistance and reveals merely a small weakness on the display lid. However, this doesn't lead to image distortions even at stronger pressure and therefore executes the usual protective purpose as expected. There are no apparent weaknesses shown in the underbody and it offers with various, easy to open covers a comfortable component access. 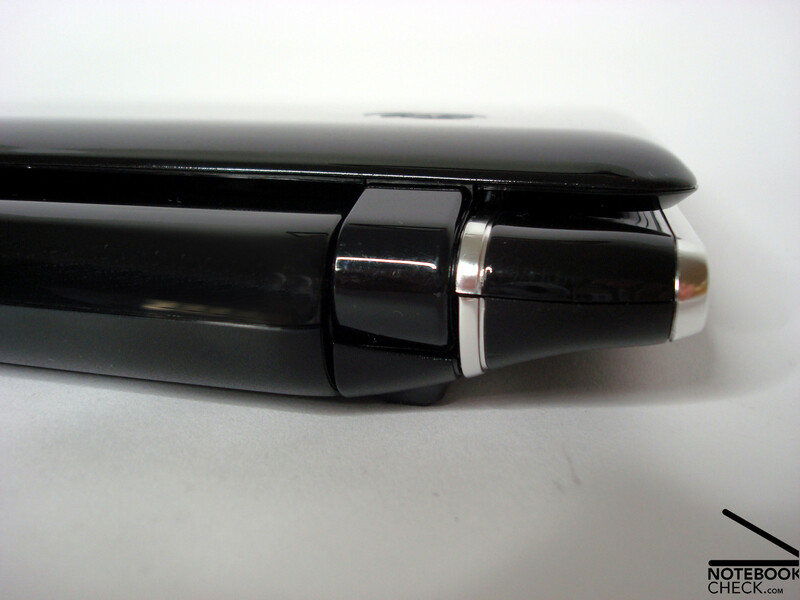 The backside integrated battery sits tight and closes concisely with the case. The display hinges make a sturdy impression and hold the display tight in position. An audible creaking at about an opening angle of 45° appears somewhat unusual to us. We couldn't establish the cause or any restrictions due to this, though. The limited, maximum opening angle of about 130° could turn out to be slightly inconvenient, depending on the application field. 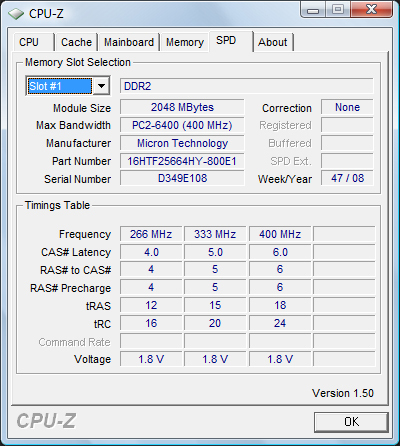 As in the already tested HP550 and HP Compaq 6735s, the Pavilion dv2 has to do without a display catch. This is executed considerably better and probably is a result of the smaller and lighter display. 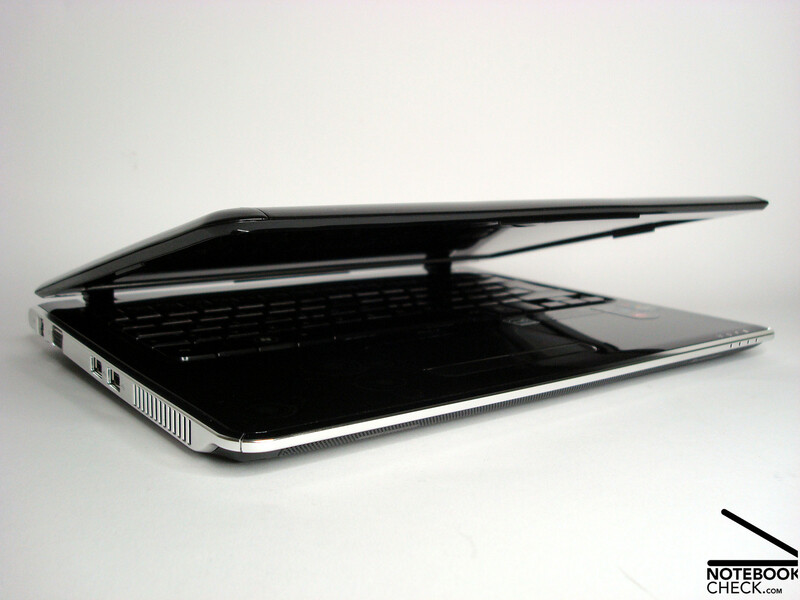 The HP only gets a bit out of line with a weight of 1.63 kg and case measurements of 292 mm (length) x 240 mm (width) x 23.7 – 33.7 mm (height) despite its 4:3 look. Competitors like the Dell Mini 12 and Samsung NC20 stand out notably with a few hundred grams less, especially since the Pavilion dv2 quickly crosses the 2 kg mark of travel weight with a comparatively heavy power supply (460g). In regards to connectivity, the HP Pavilion dv2 merely reaches a netbook level. 3x USB, analog VGA-out for connecting external monitors, headphone socket, microphone-in, 10/100 Ethernet, Kensington lock and a 5-in-1 cardreader only offer the basic functions. 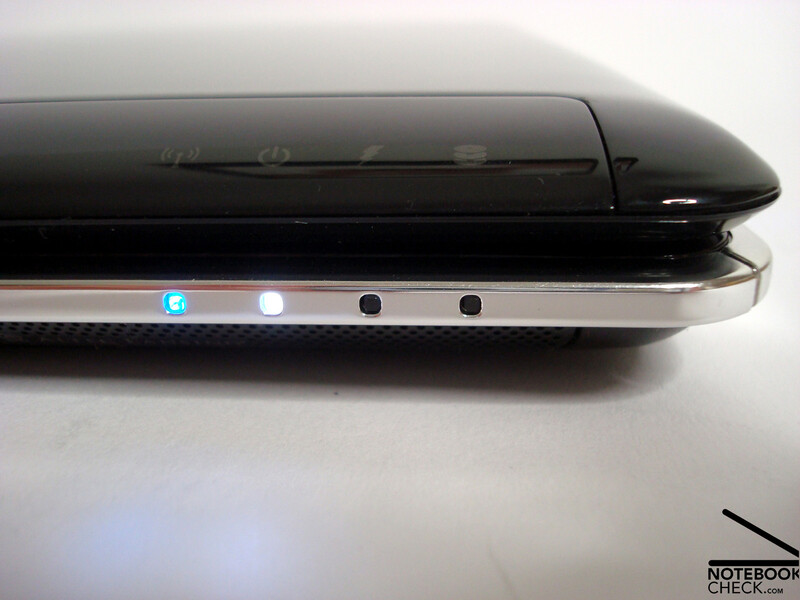 Contrarily, the connection distribution is very favorable and, in our opinion, could only have been optimized through having the audio connections be brought onto the front side. 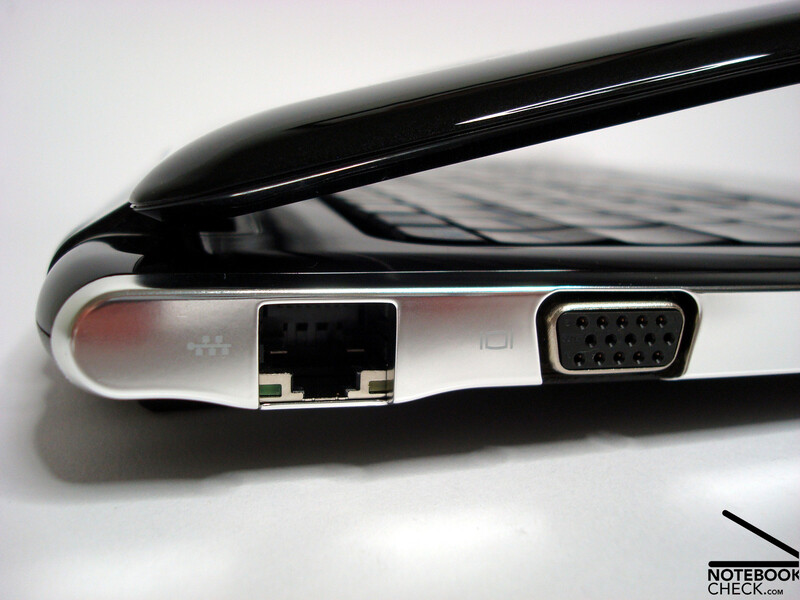 Hence, the customer has sufficient options to connect external hard disks, cameras or monitors without being obstructed from an impending cable tangle. The prospective customer has to do without extension possibilities via Expresscard slot or faster ports like Firewire or eSATA. The version, equipped with an ATI HD3410 graphic card, merely has an additional HDMI port which allows for a digital image and sound transmission to external displays or televisions. This was omitted in our model. Befitted to its rank, the HP builds up wireless communication via Bluetooth or an 802.11 b/g WLAN and covers the important requirements of private users. 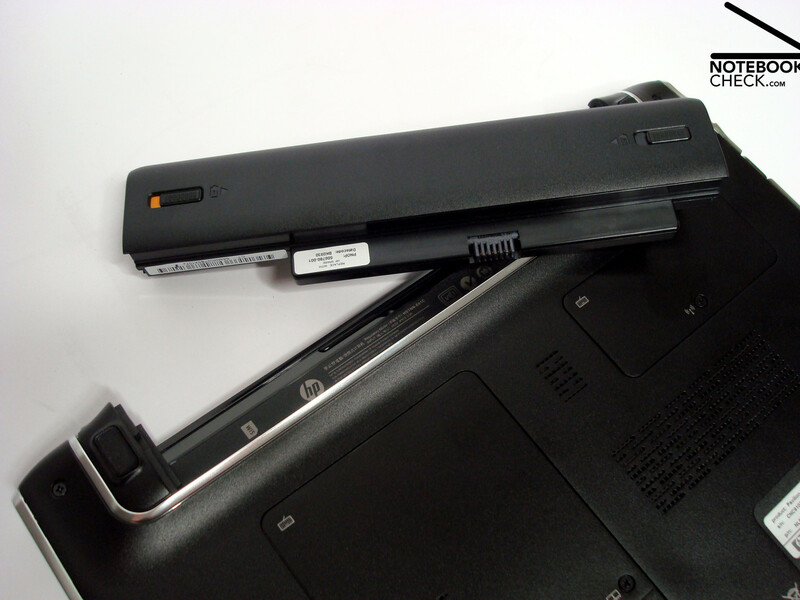 Hewlett-Packard integrated a suitable VGA webcam, which struggles with the usual weaknesses at adverse light conditions, with microphone for Skype and co. into the display frame. The included supplies are to be described as meager but not unusual. Aside from the very necessary cleaning cloth you only find a quick instruction for building up the operational state in a poster layout and a not very significantly bigger instruction guide. System media was probably omitted to begin with for the lack of an optical drive and the user has to be content with the available recovery partition for the worst possible case. HP delivers our starter's configuration at hand in the test with Microsoft Windows Vista Home Basic as the operating system and therefore also draws a border line in this detail to higher-priced configurations which can fall back on Vista Home Premium. Seen on the whole, it could be advantageous to take a more expensive model at liking, because with Vista Home Premium, a 320GB or 500GB hard disk, a dedicated ATI HD3410 with 512 DDR2 and with HDMI, a 6 cell battery, an external optical drive (only top models) and option of colors (black/white), there are a few features included which represent a significantly more flexible use and a more of value. Seen absolutely, the price of 799.00 Euros SRP does unsurprisingly seem a bit much and is on the level of definitely more efficient subnotebooks. Seen on the whole, it might be advantageous to take a more expensive model at liking, because with Vista Home Premium, a 320GB or 500GB hard disk, a dedicated ATI HD3410 with 512 DDR2 and with HDMI, a 6 cell battery, an external optical drive (only top models) and option of colors (black/white), there are a few features included which represent a significantly more flexible use and a more of value. Seen absolutely, the price of 799.00 Euros SRP does unsurprisingly seem a bit much and is on the level of definitely more efficient subnotebooks. The keyboard is undeniably the HP Pavilion's strength. With a middle-short stroke length, a soft stroke, good stability and layout you can quickly accommodate yourself to the somewhat undersized 17.5 mm and concaved keys. The key lettering is no mystery, could do with a bit more contrast in the area of the FN-combinations to grant a better readability at adverse light conditions, though. 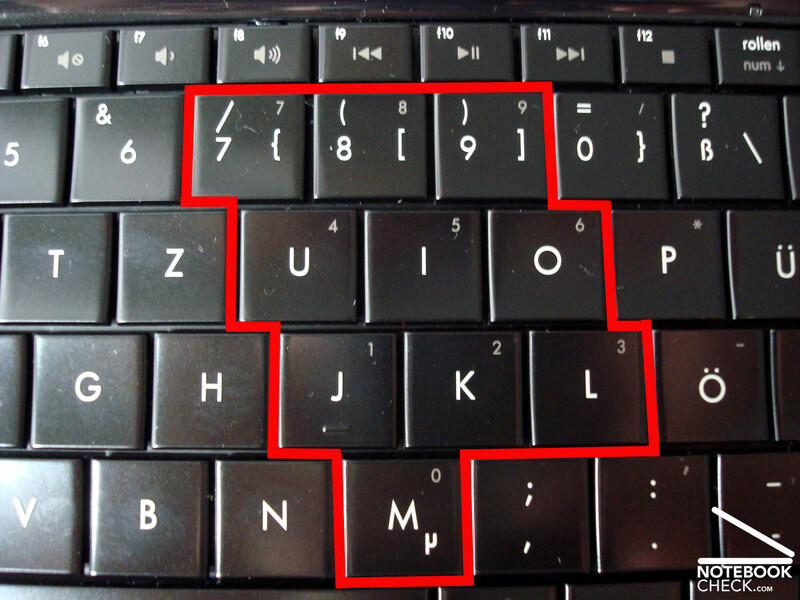 Additionally you have, due to the keyboard, a diagonally offset numerical block and important multimedia keys integrated which can be accessed to via FN combinations. 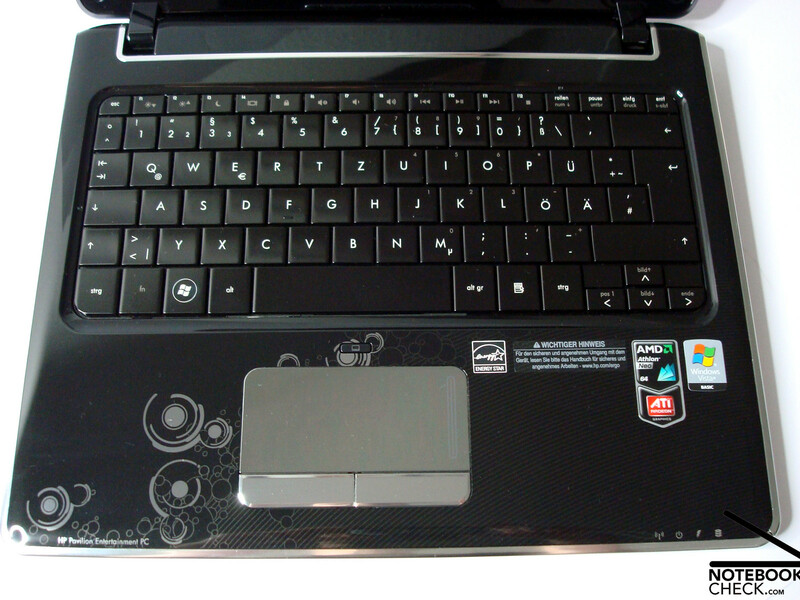 The switches applied on the notebook sides are especially favorable. Not only because they are optically attractive but also if you autotelically often use the possibility of turning WLAN and/or Bluetooth on and off comfortably by a push of a button. 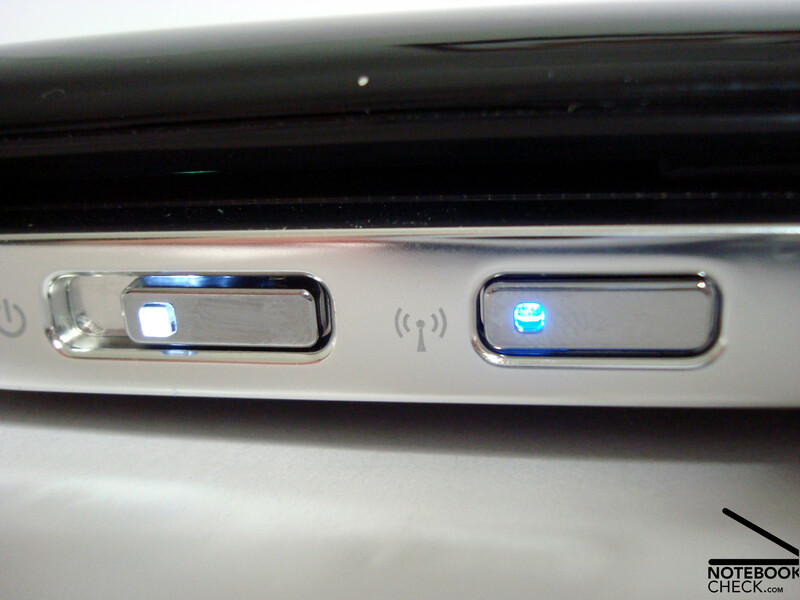 Above that, the power switch presents itself as unusual and sophisticated. This is, equipped with a coiling mechanism, used by pulling and it springs back into its start-position after letting go. Practically completely unimportant, but principally a small, stylish highlight of aesthetic and design. The applied Alps-touchpad isn't so sympathetic. Somewhat sluggish in the perceived response, the refined surface in chrome-look, which bids little gliding comfort and also accommodates an unpleasant smudge film haptically and optically, takes particular dislike. The integrated scrollbar attracts attention especially due to its less good reaction and takes quite a bit of getting used to. 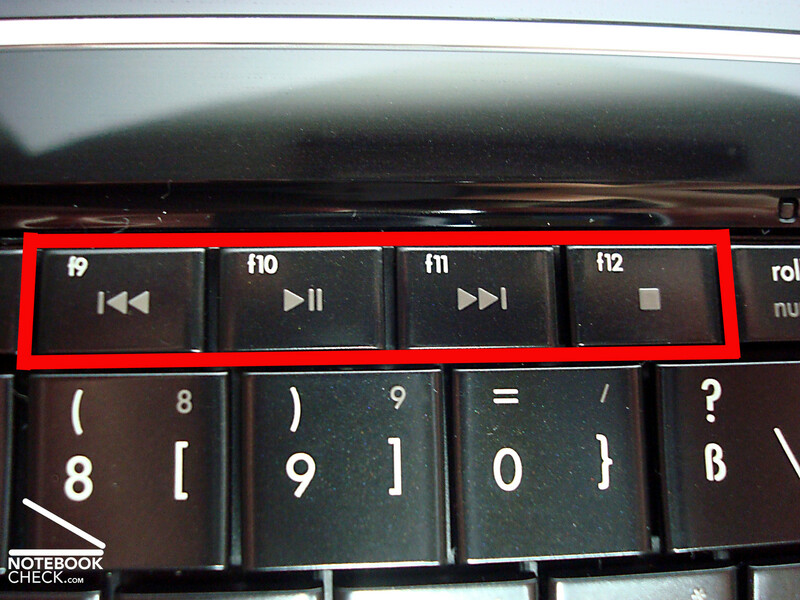 The touchpad keys also call for stronger pressure, can convince through the good feedback and full sound, anyway. 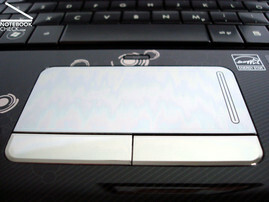 The integrated button above the touchpad is a user-friendly option to deactivate the input device easily and prevents possible errs at non-use. 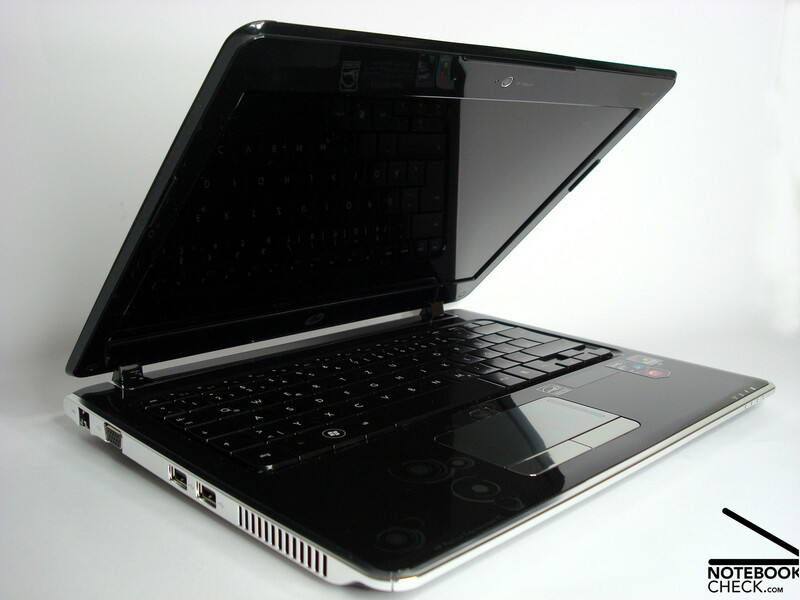 A 12.1" LED Brightview display from the manufacturer AU Optronics, which can come up with a praxis-orientated WXGA resolution of 1280x800 (124.7 dpi) pixels, finds employment in the HP Pavilion dv2. In comparison to 10.1" WSVGA competitors with 1024x600 pixels (117 dpi), you have a considerably larger display worktop at hand. This leads to a pleasant reduction in scrolling mannerism and provides for more overview. A smaller and barely noticeable disadvantage is the comparatively somewhat higher dpi value, which is responsible for a slightly smaller display content representation. The AUO screen distinguishes itself through a very good illumination of 87%, which can especially be led back to the applied LED background light. Subjectively, the brightness distribution also seems to be very constant; merely at black display content a slight formation of shades is evident. Also exemplary and almost standard in the meantime, are the good brightness values around 200 cd/m2. The HP reaches an average of 206 cd/m2 and delivers, at least theoretically, good conditions for a good readability in also bright work surroundings. In opposition to that are the reflections caused by the smooth screen surface which are unfavorable and need badly getting used to. The darker the display content and the brighter the surrounding light conditions, the more these turn up and disturb. In interiors the high brightness may have an advantage, at least in comparison to darker display variants; the disturbances outdoors become so immense that working is only possible with vast restrictions. 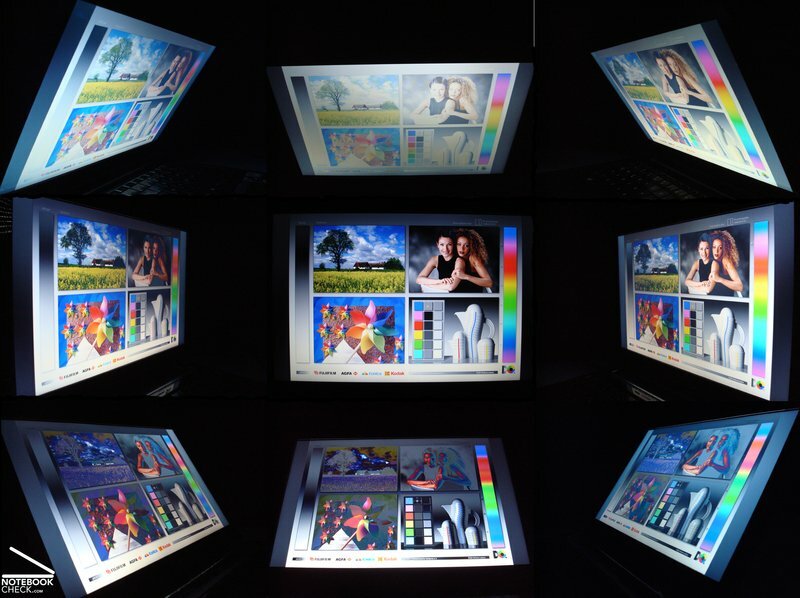 The model from AU Optronics at hand can't confirm the long-time ascribed advantage of high contrast and saturated colors of glossy displays. With a contrast value of 171:1, which results from a high black value of 1.28 at maximum brightness, the display only delivers a satisfactory value and can't attain an advantage over similar screens with a matt surface in this exercise. The screen cuts off slightly better than average in viewing angle stability matters. As it is usual, distortions become noticeable in the vertical field earlier than in the horizontal field, but allow a relatively large viewing angle, anyway, in consideration of display content recognizability. 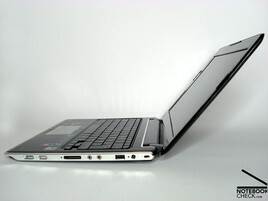 The comparatively eager Athlon Neo MV-40 has a considerable drawback with a TDP of 15 W in regards to the power consumption of the Intel Atom competition, which is content with just 2.5 W. Knowing this, AMD places the enhancements originating from K8 into the subnotebook sector and tries to score with a good performance and economy ratio in the starter's category. 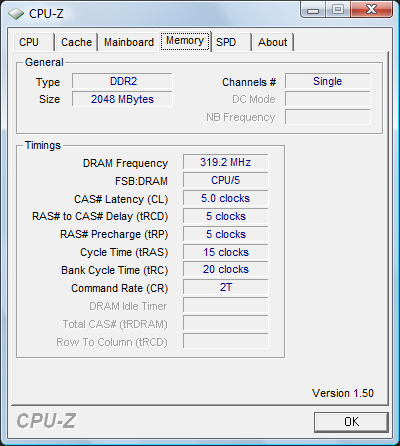 The Athlon Neo with a clock rate of 1.6 GHz has one CPU core, which can fall back on a L2 cache with 512 KB and is connected to Northbridge with a FSB of 1600 MHz (HT800). This is supported by a 2 GB DDR2-800 RAM (1 memory channel) and an integrated ATI Xpress X1270 graphic unit, which doesn't have its own storage. This has to "borrow" up to a maximum of 894 MB via HyperMemory from the CPU and therefore has, like it's common of all graphic chip sets, a more or less braking effect. Those who are considering equipping their system with additional main storage, among other things, have to replace the existing module with a 4 GB module because there is only one slot available. The Athlon Neo can distinguish itself considerably from the Intel Atom division in the CPU benchmark results according to its requirements with 5801 points in the Dhrystone, 4910 points in the Whetstone, 1287 points in the Cinebench R10 and 61 points in the 3DMark'06 CPU. 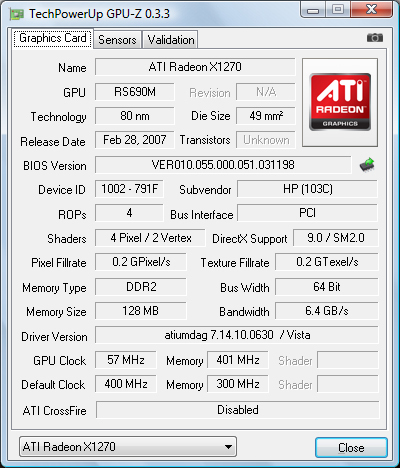 This becomes even more apparant in the graphic performance because the applied ATI X1270 graphic has a performance-plus of almost 100% in opposition to what the Intel GMA 950, dominating in netbooks, can offer. 337 points in the 3DMark'06 is on the Intel GMA X3100 level and the Cinebench R10 OpenGL Shading shows a clear distance with 557 points. But the alternative from ATI isn't suitable for performance-eager 3D computing or 3D gaming, anyway and bids only the basic functions. 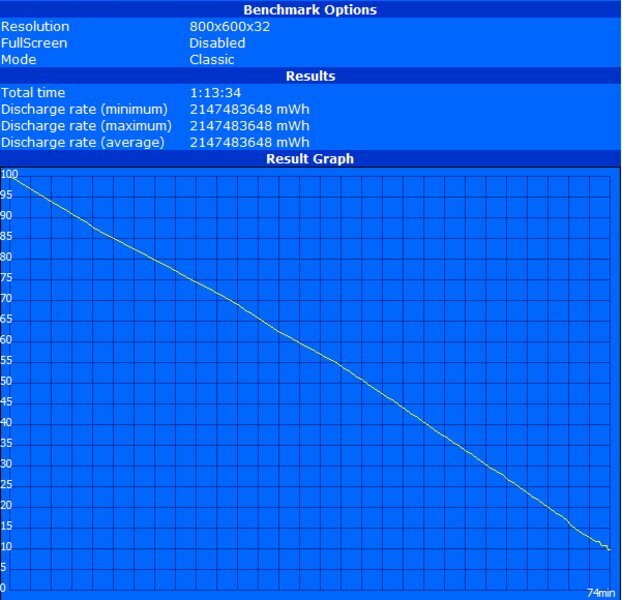 The AMD system can't profit as much in the application benchmark PCMark'05 with 1878 points and reaches merely an advantage of 20% in opposition to the netbook competitors from the same manufacturer: HP Mini 2140. Contrarily, the system bids a conflicting impression according to the perceived velocity. As you can also practically feel a considerable performance-bonus in comparison to the Atom competition, it comes to long breathed stalemates when running several programs simultaneously. The system seems to be partially blocked and only gives slow reactions. The disadvantage of one core processors becomes obvious at daily tasks in comparison to the two core alternatives, which react considerably more flexible and can supply performance. 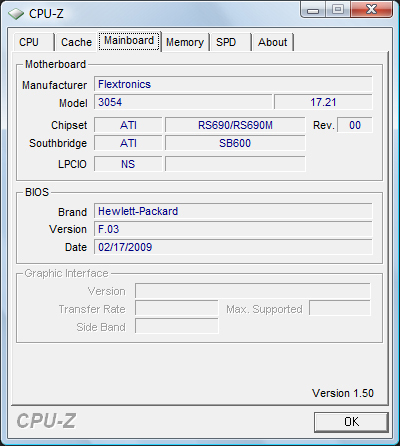 This conduct is comparable, even if somewhat slower, to Intel Celeron M notebooks, like for instance the HP 550 which we tested some time ago. You can't establish bigger restraints but everything does take a bit longer than what you are familiar with from notebooks with dual core configuration in the starter sector. 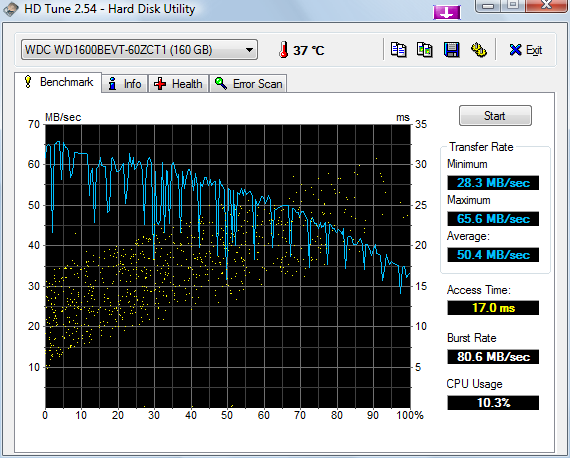 The HP Pavilion has been treated to a 160 GB (gross) capacious model from Western Digital in regards to the hard disk, which delivers an average transfer rate of 50.4 MB/s with 5400 rpm. These are good contemporary rates which don't cause any restrictions. We have to live without an external optical drive, which is included in other higher-priced configurations, though. With 35.2 dB(A) up to 36.2 dB(A) which turn up on the mass of basic applications such as Office, Browser, iTunes or PictureViewer, the constantly running fan is quiet even if present and audible. The sonorous noise is of a subjectively pleasant nature, which doesn't irritate as much as some other unquiet, or running on a higher frequency fan. The maximum reached 43.3 dB(A) measured under load have basically a similarly discreet character but are experienced to be unpleasant and to have disturbing effects after a longer period. Accordingly, the Pavilion dv2 can't hold a candle to the low noise levels of many netbooks and is clearly inferior to these in the system noise aspect. The temperature production doesn't cross the 40°C mark at any point and therefore they turn out rather low. Generally, the heat development presents itself as homogenous and only in the bottom-left middle sector a slightly higher heating of approx. 39°C becomes evident. There aren't any restrictions to be awaited due to this. The included SRS Surround speakers from Altec Lansing are accommodated in the front area and deliver an adequate sound for notebook proportions. The volume field, luckily, covers a large spectrum and allows for a good adjustment to the single surrounding conditions. Undistorted, but very treble-prone, with weak medium notes also leave the basses only to be predicted here, as well. You are still far-off from Home Entertainment with the Pavilion dv2 despite audible surround traits but it can apparently beat most notebook representatives in any case. 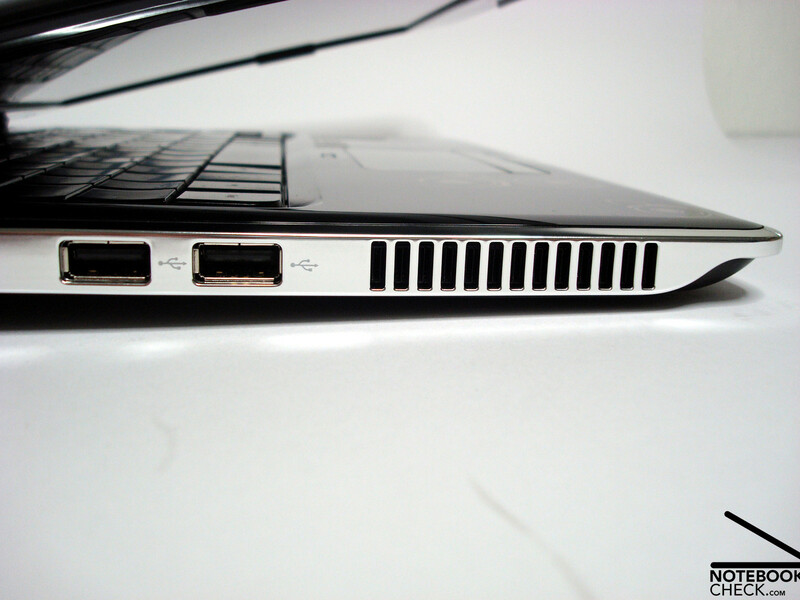 The HP only delivered average values in the power consumption field. Despite a clock rate reduction of the CPU (800 MHz) and GPU (250 MHz/ATI PowerPlay) in the energy savings mode, the total system allows itself a minimum of 14.3 Watt. This is, leaving the form factor aside, in comparison to superiorly configured business notebooks with a 2 core CPU and without LED display, like the Asus B80A or the HP 6735s not very reserved. These underbid the Neo-driven dv2 obviously to an extent with a minimal power consumption short of 11W, respectively 14W. The HP Pavilion can first play out its advantage at the maximum system load with a power need of under 40W and is on about the same level with the equipped Intel Celeron M and GMA X3100 HP 550. Good subnotebooks like the Lenovo X200 naturally do the job better, but with around 1200.00 Euros cost twice as much and therefore blow some budgets. The battery runtimes, with a rather tightly measured 4 cell battery with a capacity of 41 Wh included in our configuration, are therefore in total merely in the middle field. The notebook reached a runtime of 208 minutes in the BatteryEater Reader's test (maximum possible runtime). That is quite alright in comparison to other subnotebooks in this price category, but can't keep up with 12" netbook competitors like the Samsung NC20 or Dell Mini 12 (with a 6 cell battery) in this regard. The HP still reached a whole of 74 min. under load in the BatterEater Classic test (shortest possible runtime) and will only provide for a short period of fun. The system then again copes better with a low system load, as in form of mobile browser tasks, and holds on for 162 min. 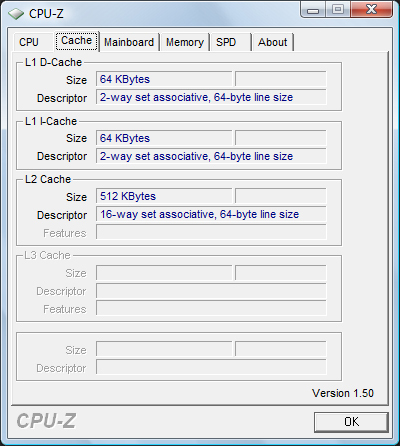 The models with a 6 cell battery should deliver better runtimes, despite the probably higher power consumption through the applied ATI HD3410 graphic. 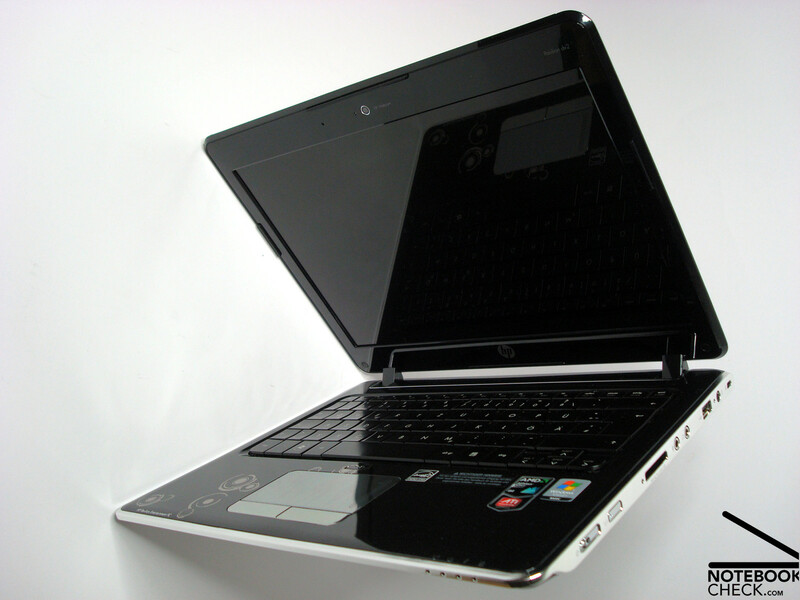 The HP Pavilion dv2 with an AMD Athlon Neo MV-40 CPU and ATI X1270 graphic falls exactly into the aimed for gap between netbooks and subnotebooks, in regards to performance and configuration. Slim, chic and target group-orientated, HP presents us a thoroughly well-executed combination of performance and mobility. However, the reflective and contrast poor display, the mediocre runtime, the not always quiet noise conduct and such found flaws in our test model have a restrictive effect. The manufacturer should improve these as quickly as possible so that the very good basic attributes aren't unnecessarily relativized. 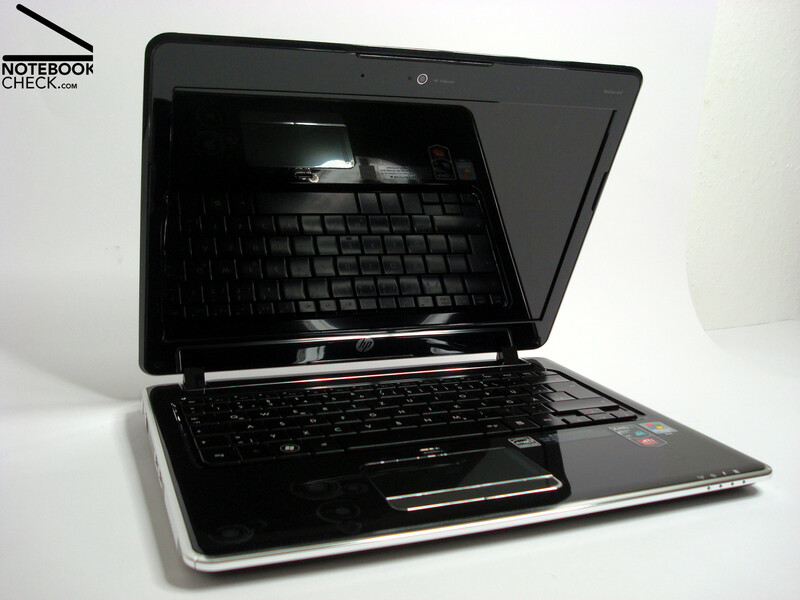 The HP Pavilion can book the very chic and slim appearance, the well-elaborated details, the extremely good keyboard, the relatively good performance, the on the whole good case and manufacturing quality and the otherwise comparatively good display on the credit side. In comparison to that the notebook weight, the interface configuration and the power consumption are mediocre. Of course these points provide additional room for improvements, but it is, in regards to construction, difficult to improve a product which is already being manufactured and should be considered for a possible successor. There will be a hard battle especially with the strong competitive pressure which thrashes onto the Pavilion dv2 from two directions. The in the meantime emerging netbooks of the 12" sector and the established subnotebooks make the newbie appear rather expensive. The situation will additionally be intensified through the availability situation of the first products based on Intel's CULV CPUs and therefore exactly the same target group which AMD is aiming at. Many thanks to Notebook.de who kindly provided us with the test device. You can configure and purchase it here , as well. Generally a reflective appearance with high care requirements. 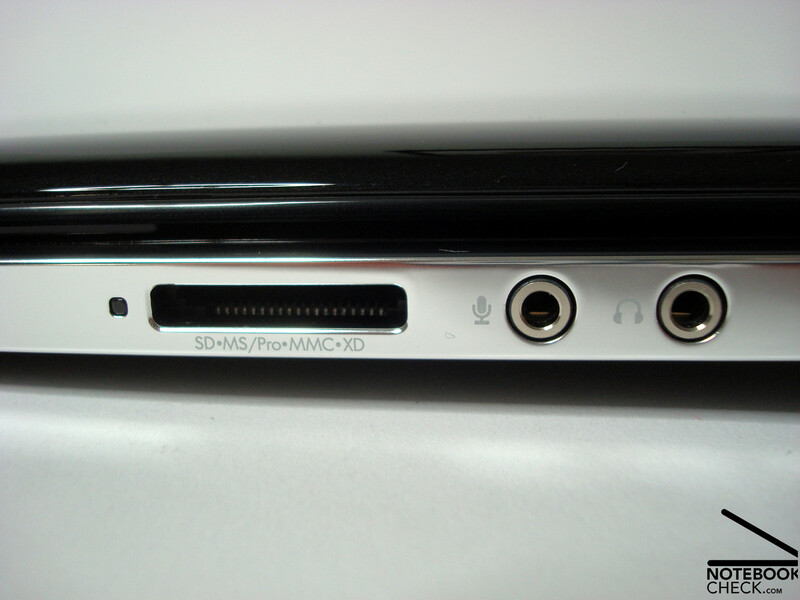 Slightly protruding component on the right beside the hinge. Aesthetic snap-switch for on and off, hardware switch for the radio wireless components. The reflective traits in the display area turn out to be especially irritating and lead to unnecessary restrictions. The top model is aside from the black variant tested by us also available in white. …despite the deficiencies, an elegant appearance without a doubt. 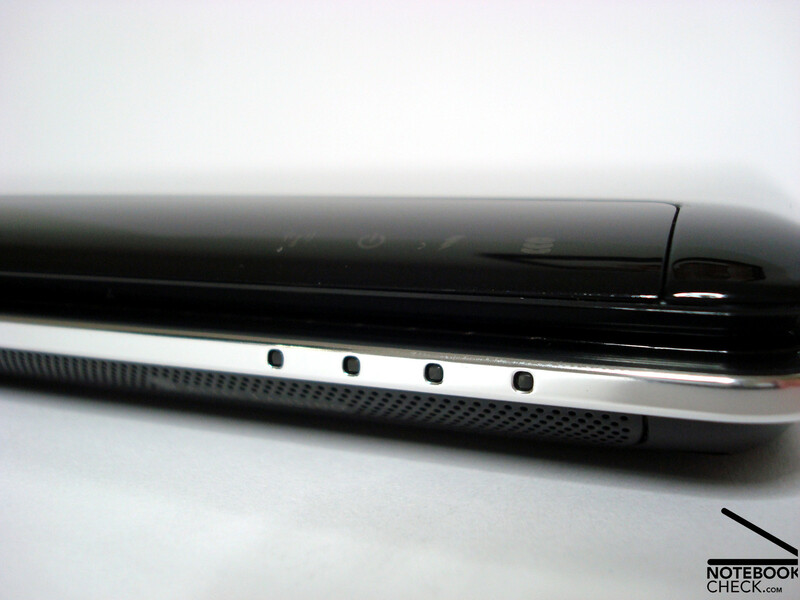 The silhouette seems very slim also due to the silver-colored side components. Well-placed USB ports which are arranged rather close to each other. Far in the back: LAN and VGA connection. 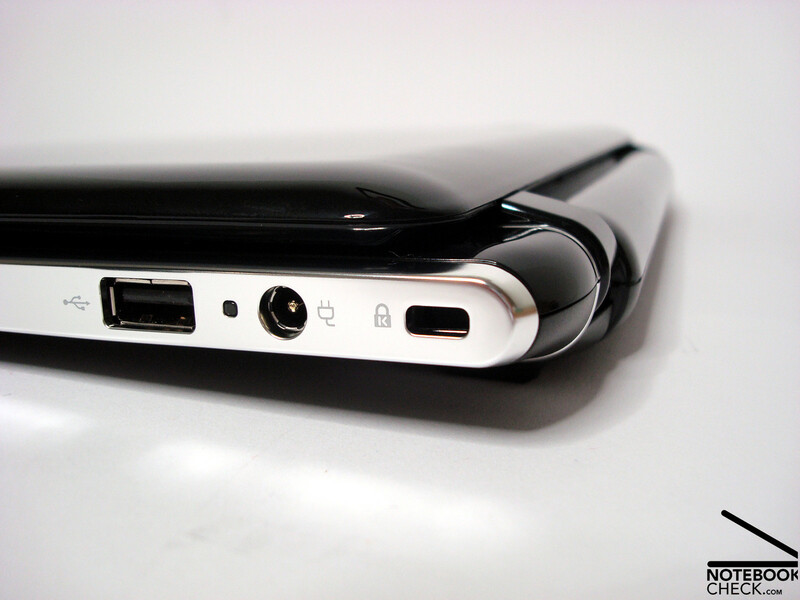 Very well-positioned 3rd USB port, which has the power socket and Kensington lock as a neighbor. The cardreader which also can process XD cards and audio connections. The generally perfect complete package with unusual detail solutions in an elegant dress. A matt display, low noise emissions under load and a battery with a higher capacity. 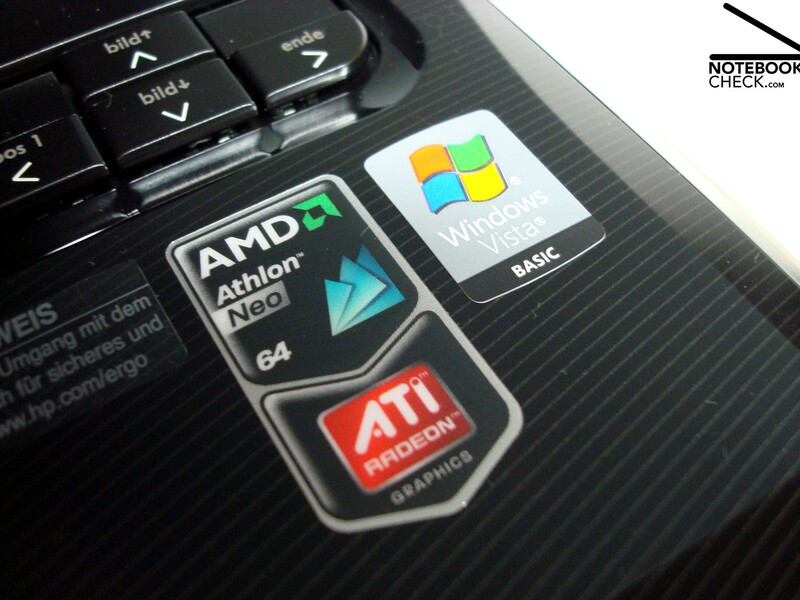 That the Athlon Neo MV-40 is only economically suitable to an extent.